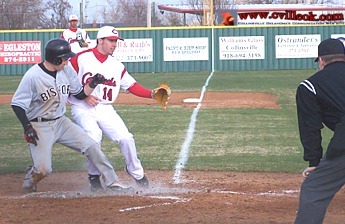 Jordan Musto (#10) didn't connect on this bunt attempt against Bishop Kelley. 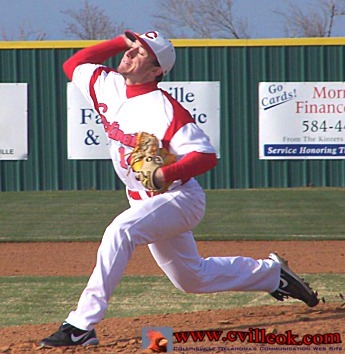 Nick Goza (#14) was on the mound for the Cardinals in these first inning photos against Bishop Kelley here Thursday March 11th. Peter Rodriquiz (#13) brought in the first two Cardinal scores with this 1st inning homer to get the score to 2-3. 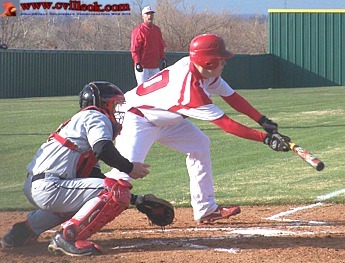 Brett Werdel (#3) had singled to lead off the inning. Bishop Kelly had already had a 2-run homer in their half of the first for a 0-3 lead then. 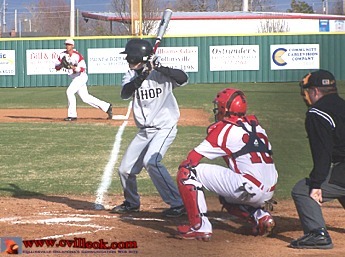 Jordan Musto (#10) was behind the plate. Bishop Kelly added a 4th run on this play early in the 2nd inning before I had to leave Thursday (having just stopped by briefly on my way back from the track meet at Skiatook). 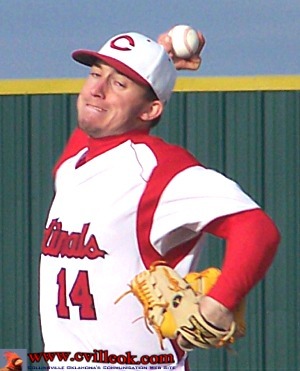 A post-game report from Gavin Rose indicated the Cardinals rallied for an 8-7 victory with Randy Rogers throwing out a BK runner at the plate to preserve the win.